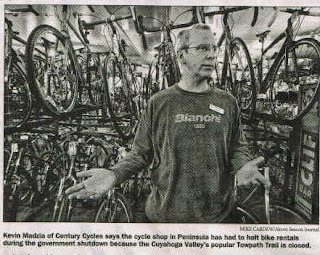 The federal government shutdown of October 1 through 16, 2013 saw the closing of all facilities and trails within the Cuyahoga Valley National Park, including about 21 miles of the Ohio & Erie Canal Towpath Trail. The Century Cycles store in Peninsula sits right in the middle of the National Park, so the shutdown had a significant effect on business, mainly from the inability for people to use our bicycle rental service on the Towpath Trail, but also from associated business from cyclists and other visitors to the National Park. The park, the trails, and our bike rentals are back up and running again. As the old saying goes, for every dark cloud, there is a silver lining. The silver lining in this situation is the media attention on Century Cycles and other local businesses, as newspapers and TV stations flocked to the little village of Peninsula to hear our take on the situation. Reporter Bob Downing and photographer Mike Cardew visited Century Cycles and other businesses in Peninsula. This article ran in the Oct. 4, 2014 edition the next day. Click here if the video above is not appearing for you. We're not sure how, but we were spotted on the national radar, as Bloomberg posted this article about the shutdown on their web site. 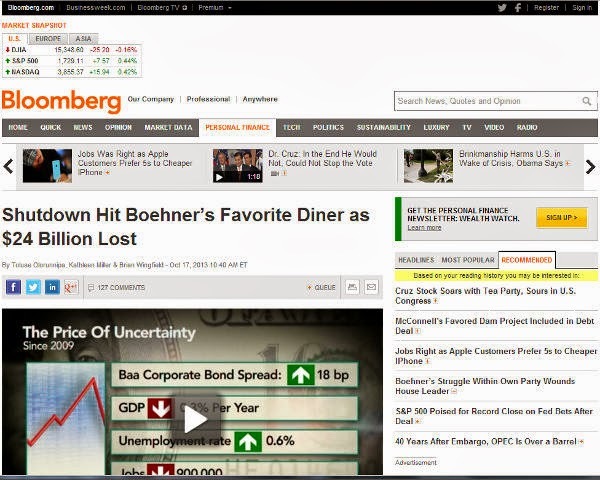 Somebody at CNN noticed the Bloomberg article, so they called us in Peninsula to get some more information. The folks in Peninsula directed them to Scott Cowan. CNN wanted to include Scott in a live on-air interview with business commentator Richard Quest. This would require some technical know-how to set up. Former CC Marketing Manager Tracey Bradnan suggested that we look to the Rocky River Chamber of Commerce for help. Liz Manning from the RR Chamber was very helpful in directing us to OpenLink, a Document Management and Outsourced IT Solutions company based in Westlake. CEO DeWayne Ashcraft and President Rusty Deane were extremely helpful in setting up the videoconferencing equipment necessary to link up with Richard Quest at CNN. Thank you all for your help; it could not have happened without you! Online Poll: What's your favorite style of beer? Cargo trike on the job!